This is Bob. He has been our house guest over the holidays. 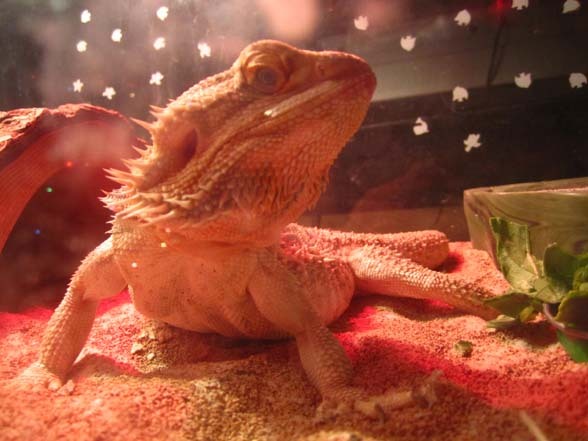 He is a bearded dragon. We are watching him for a friend of a friend. Our friend who was originally Bob-sitting went on a trip of their own, so they asked us to finish out the Bob-sitting. Now we are going on a trip of our own, (a gymnastics meet 2 big cities to the north) so we hope Bob's owner comes to claim him today. We have enjoyed Bob very much! He doesn't say anything, but his expressions and head-tilts are very endearing. He eats meal worms and berries and romaine lettuce, and it's fun to watch him. His tank is situated in our living room, and he is smart enough to know where to look for us in our comings and goings. Have a good life, Bob! We've enjoyed you!